Filmmaker Kevin Smith has always been a fairly prolific director of various films and TV (alongside his podcasting empire), but the last few years have seen several planned projects go by the wayside, including Clerks III and his hockey epic Hit Somebody, as well as a TV series based on Buckaroo Banzai. Now Smith has posted to Instagram that his planned Mallrats TV series has become untenable, so he has written a script for a return to his View Askew Universe called Jay and Silent Bob Reboot. Significantly, there’s no mention of Moose Jaws, the third part of Smith’s planned “True North Trilogy” featuring The Colleens (Harley Quinn Smith & Lily-Rose Depp) and Guy Lapointe (Johnny Depp). Given that the last two parts (Tusk and Yoga Hosers) did very little business and were ravaged by critics, it seems logical that funders have turned off the money spigot on Moose Jaws, though that’s pure speculation at this point. 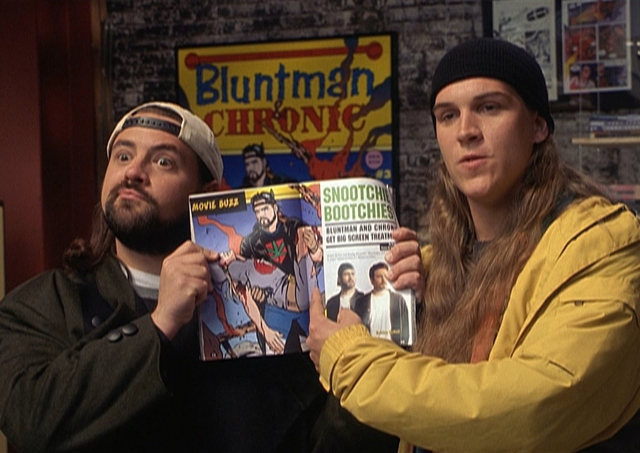 As for Jay and Silent Bob Reboot, it sounds like it will play as a direct follow-up to 2001’s Jay and Silent Bob Strike Back, which followed the pair played by Smith and Jason Mewes set out to stop a “Bluntman and Chronic” movie from being made. It was meant to be the final View Askew movie, with God (Alanis Morissette) literally closing the book on it. However, he eventually returned with Clerks II in 2006, as well as the little-seen 2013 oddity Jay & Silent Bob’s Super Groovy Cartoon Movie. Other films in the View Askew canon include Clerks, Mallrats, Chasing Amy and Dogma.